Readers of this blog (you and my mum) will know that we have been talking about our ethnographic toolkit for quite some time. I am all for the public/open innovation approach of telling everyone everything I'm doing (unless a client is involved) and using the feedback to create something even better, as I'm building it. When I had just started mentioning my idea for an App, an anthropologist emailed me to say that she liked the way I was thinking very much and was looking forward to buying the final product. However, in the meantime, she was happily using Evernote, a kind of sophisticated TODO list which allows pictures and notes to be captured and saved to a cloud. This wasn't really competition. It was more like inspiration. And it didn't use video. 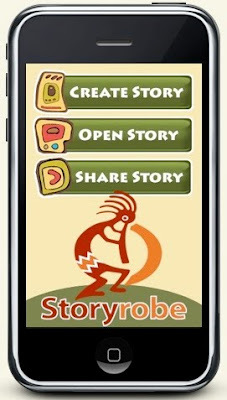 What really took me by surprise, however, was a story telling App called Storyrobe. I hadn't come across it at all until someone who was reviewing my App for Core77 mentioned it. It wasn't an ethnographic tool. It was a story telling tool. Designed to allow users to take pictures and to narrate them with voice recordings. A kind of still photo co-discovery rather than our video based co-discovery. Again, not designed for ethno-fieldwork but nonetheless used by some social scientists. So I wait to see what other Apps will pop up that have eluded my radar. The trick, I think, is to keep innovating openly and thus keep one step ahead. We already have updates coming online in Q1 2010 which will allow users to sync captured events to a cloud. I am also exploring functionality such as a bar code reading function to allow consumers to record all of their purchases effortlessly (for video diaries) and live video streaming. Among other things. What I feel certain about is that 12 month from now we will not be the sole operator in this very exciting field. I also feel certain that we will be the furthest ahead. I will keep you updated on how my competitive set increases in size.